Backpacking opens up opportunities to stay out in the woods longer and explore trails and peaks for days at a time. We can help you reach those faraway peaks like Isolation or Owl’s Head, guide you on a multi day Presidential traverse, and more. 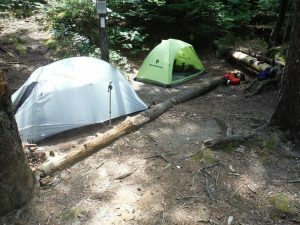 Backpacking in the wilds (per forest camping rules and LNT). Expand your horizons, train for a through-hike, build your confidence, or just stop to smell the roses more as backpacking will reduce those daily mileages. In any case, we can help. We can take people to any of the shelters, tentsites, or any number of wild camping options… even usage of huts and cabins, if so requested (though extra charges apply). Our woodland and alpine backpacking adventures — assuming a Camp Craft course isn’t needed — begin with a simple overnight, two days, one night with distances variable based on ability and desire. From there we cover a three-day, two-night trip, and do know we can offer greatly extended trips as well. It’s up to you! Please include any special objectives or desires you may have, if applicable, in the comments box of our Booking Form. Think layers. While a ski jacket, for example, may be warm and waterproof, if the insulation can’t be separated from the rain/snow protection layer, it really isn’t suitable. 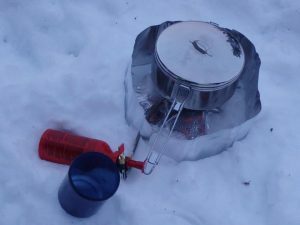 You will overheat if you need rain/snow protection while hiking. Bring independent layers. Having our “Ready Pack” will solve the matter offering all you need for at least the hiking portion of your adventure. Never wear cotton, even at the underwear level. Synthetic materials, wool, and especially performance/wicking materials should be your clothing of choice. For hiking, since cotton won’t dry and doesn’t insulate while wet, it can pose a hazard. 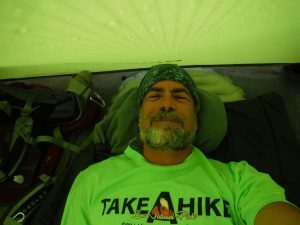 You will want to wear the right type of sports or hiking clothing and you will want to bring extra, especially a base layer or shorts for sleeping in. Bring more than you think you need. Mountain weather can be very tricky and unpredictable. While it may be nice in town, the mountains can be very different. Being prepared can save your life and make for a richer, more enjoyable experience. For footwear, sneakers or trail runners may be suitable for summer backpacks, but for spring or fall something a little sturdier and warmer like a three-season backpacking boot is recommended. 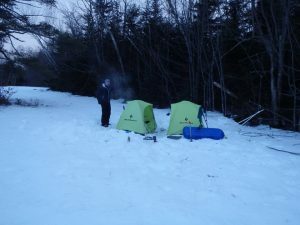 And in winter, winter-rated or even mountaineering boots are needed, specifically, “double” boots with liners that can be brought into your sleeping bag at night. Additionally, camp footwear like Crocs in summer and down booties in winter are worth bringing. And speaking of winter, notably above treeline, you will want to prep for Denali. On some days. Seriously. 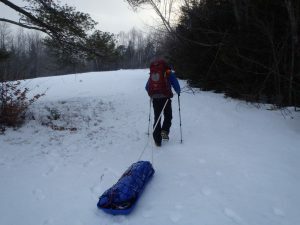 Adding gear such as the following as a minimum is expected: Heavy-duty hooded parka, overmitts with liners, crampons, balaclava, and even a set of goggles. For your hiking/backpacking gear needs, in addition to your own non-cotton base layers, hiking/climbing pants (or shorts in summer) with shirt, footwear (camp and trail), and a sleeping baselayer or shorts, as described above, we offer three options (which are modified by the season). Click to expand. Proper footwear (see information above, especially about camp wear). Proper clothing layering (see information above, plus sleeping items). 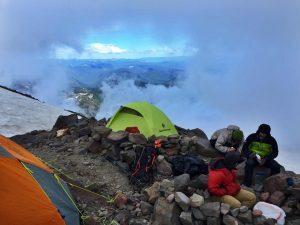 Conditions-rated tent/shelter, bivy, or hammock. SPECIAL NOTE: Depending on group size, we may be able to furnish the items above. The “other essentials” will be provided by your guide(s), though you are strongly encouraged to bring your own gear if you you have it. A lined pack with hip belt and room for the items below (~45-65 liters). Water for the day, at least 2 liters, plus extra (or filter, if not winter). Down blend puffy, $25/person/day (winter). SPECIAL NOTE: If any outsourced gear such as mountaineering boots with step-in crampons is needed, as might be the case on above treeline, winter hikes, we can rent it ahead of time for you for $40 plus the applicable rental fees. This activity has a 1:4 guide/client ratio. The maximum group size is 4 with 1 guide. For parties larger than 4, please contact us. Not ready for this? Try out our Camp Craft course. Otherwise, go ahead and BOOK IT NOW! Below are photos from previous backpacking adventures. Click on the photos to enlarge them. We adhere to the seven principles of Leave No Trace (LNT) and ask that others do the same.